Most of us are in the field for the cause, not the money. We care for the profound impact international education has on our students and the world. We work for the greater good and surround ourselves with lifelong learners. And we do it because we love what we do. But we also have to pay our bills. We want to have a worthwhile career. And, one day, we’d like a cushy retirement—at least I do!— so that we can visit all those places around the world that we have been promoting throughout our tenure as international higher education marketing and communication professionals. Given that our MIG membership is vast and diverse, we wanted to get a feel for where our members work, what their titles are and how they are compensated for their work. At the end of 2017, the Marketing & Communications MIG sent out a “compensation survey” to its member base. The response was tremendous: 73 international education professionals from private and public institutions; program, service and resource providers; and associations filled out the survey. After carefully reviewing the data, we were able to use 60 of those responses for our analysis. The other 13 either put down that they worked part-time or left information out that were essential for the analysis. 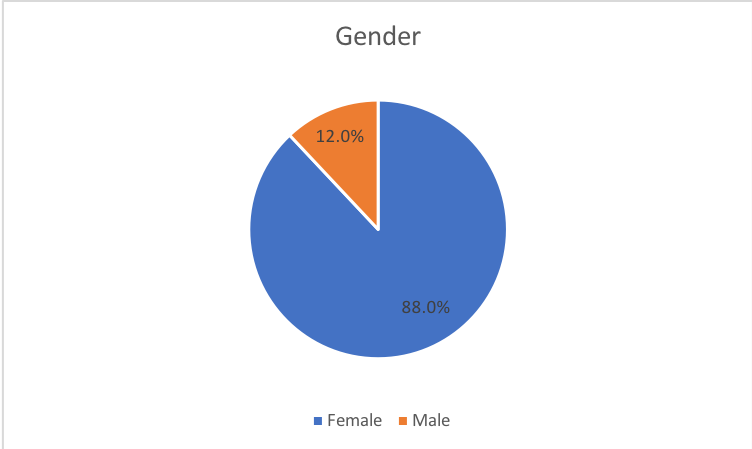 88% of the respondents are female, 12% are male. 82% of respondents work at a university - 71% at a public institution and 29% at a private university. 17.5% work at a program provider, and o.5% work at a service or resource provider, or at an association. 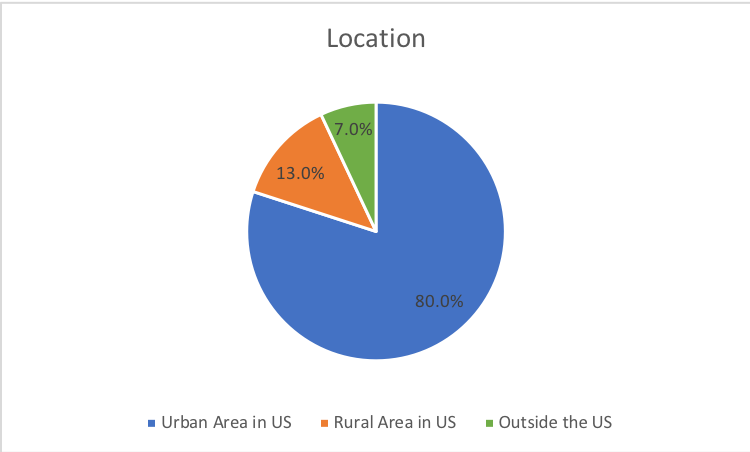 80% of respondents’ employers are located in an urban area, while 13% are in rural areas. 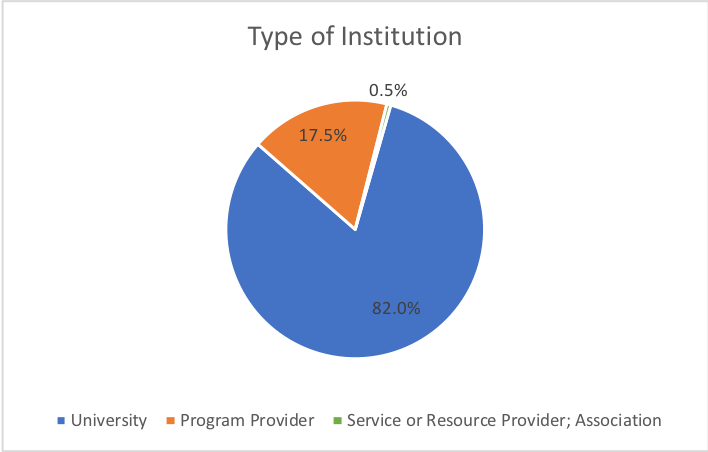 These 13% are all made up of public institutions, putting all private universities, providers and associations in urban areas. 7% of the 60 respondents are located outside the U.S: in Europe, South America and Canada. Not surprisingly, the amount of marketing experience varies greatly. 36% reported fewer than 5 years of experience. 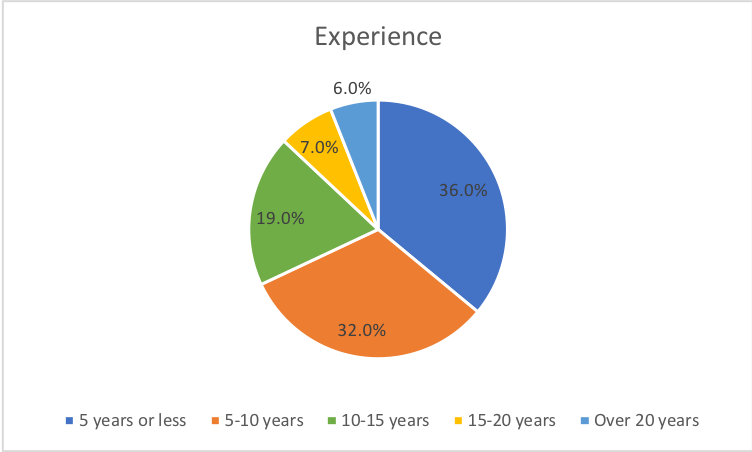 32% reported between 5 and 10 years, 19% between 10 and 15 years, 7%, between 15-20 years, and 6% indicated more than 20 years experience. 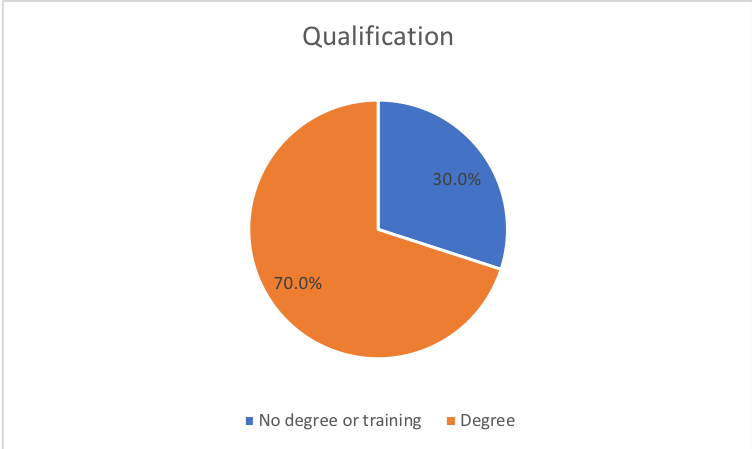 30% of the respondents indicated they do not have a degree or any training in the field. This seems to coincide with the fact that when asked: “On a scale of 1-10, tell us how much of your job duties are related to marketing and communications,” 17% of respondents reported “5 or less”. Of these 17%, the majority do not have a title related to marcomm, indicating that only parts of their overall responsibilities are related to this area. Getting a handle on the job title was rather difficult. Of the 60 respondents, only 28% shared job titles with others, such as Director of Marketing and Communications or Outreach Manager. The remaining 72% of respondents all put down different titles - see the sample on the left. Due to various factors, including different titles, levels of experience, full-time vs part-time, as well as homogeneity in gender, it became difficult to properly compare the salary data and draw validated conclusions. However, it did provide an interesting insight into how professionals in our field are compensated. 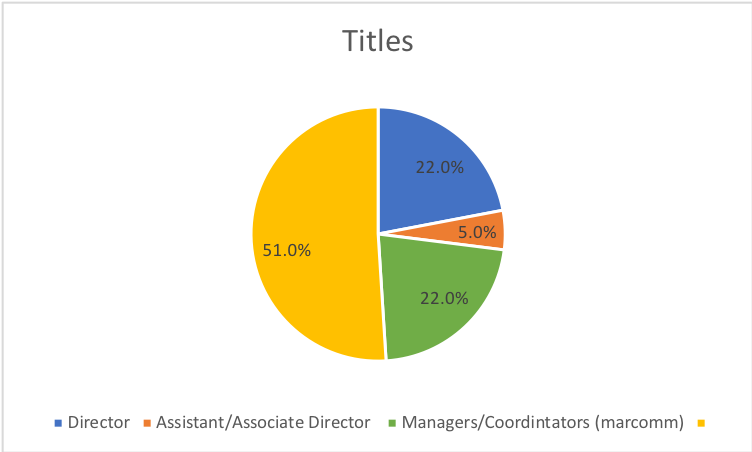 13 respondents reported a Director title with an average salary of $76,353. 12 of these were female, and one male. 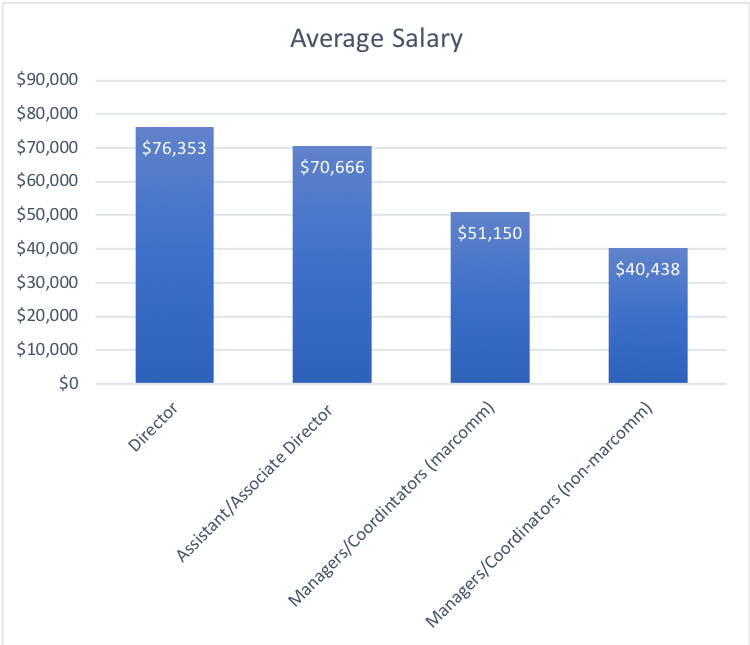 Three respondents fell into the Assistant and Associate Director category, with an average salary of $70,666. We broke the Managers and Coordinators category into two subcategories, since a solid number— 30% of respondents— indicated a title with no reference to marketing and communications. Of these, the average salary was $40,438. Only 2 respondents were male and averaged $35,500 in salary, while female respondents had an average salary of $41,336. The other 70%— respondents who put down marcomm related titles— had a salary average of $51,150, with one male and 29 female respondents. Location on the manager and coordinator level did not show a significant salary difference. However, on the two director levels, there was a difference of $15,000, with the urban areas paying more. Private university director levels show a lower average salary ($73,750) than public ($80,000) universities. Program providers in the manager/coordinator level tend to earn on average a few thousand dollars more than those working at universities. While males only made up 12% of total respondents, in 2 of the 3 job level categories, males were top earners, which could point to a pay gap in the marcomm arena of International Education.